The Sealers' Ball: This song is probably better known in Newfoundland by the first line of the chorus; "Be ya much of a hand aboard a vessel?" It's the story of a couple of young fellows who get in off a sealing vessel with a few dollars in their pocket, get into the rum and make fools of themselves by getting into a racket over a woman. She, evidently being too sensible for either one of them and unimpressed by their macho antics, leaves them to their nonsense and goes on her merry way. Blow The Wind Westerly: Fergus learned this song from the repertoire of Charlotte Decker of Parson's Pond, as published in Kenneth Peacock's Songs of the Newfoundland Outports. It's a rare thing; a Newfoundland song about sea creatures and no one trying to catch them. Payne's Choice/Old Boney/The Bluebird: Three jigs learned from the late legendary Newfoundland fiddler Rufus Guinchard, the first and last of which he learned from Uncle John Peter Payne. Old Boney was the name of a dog owned by Jack Brophy, a good friend of Rufus's when they were boys in the early part of the last century in Daniel's Harbour on Newfoundland's Great Northern Peninsula. When We Was Boys: Prior to the start of a concert at the Cape Bonavista Lighthouse, Jim met and struck up a conversation with Heber John Keel, a local octagenarian who described the bustling scene around Bonavista Harbour when he was a lad, and lamented the changes over the years that culminated with the moratorium on the northern cod fishery. Ironically, Bonavista is the place where John Cabot is reputed to have landed in the new world and could catch fish in abundance merely by lowering baskets over the side of his boat. Replaying the conversation in his head while driving back up the spectacularly beautiful eastern side of the Bonavista Peninsula, Jim took Mr. Keel's story and put it in rhyme. The Gay Gunners: This song was composed by Peter Leonard, also known around Placentia Bay as Peter the Poet, who made a lot of songs about life in the bay during the early- to mid-twentieth century. It's the story of two fellows who go hunting sea birds without taking the necessary precautions of being prepared for all eventualities when out in an open boat on the wild North Atlantic. Thinking they know their business, they take no food or water and promptly get lost in the fog. Happily, they make their way home safely with nothing more than embarrassment to show for their day's outing, but their folly was the subject of a good-natured ribbing from the pen of Peter Leonard. Sea birds are still a valuable source of fresh meat for many families in rural Newfoundland. Jim got the song from Newfoundland poet, singer and fiddler Des Walsh, who had compiled a collection of Peter Leonard's songs. Hounds Tune/The Four Sisters/Susannah Perry's Tune: A lively set of step tunes, the first and last of which are again from the repertoire of Rufus Guinchard. The Four Sisters was composed one night by Colin and Graham along with Mike Walsh and named for the row of houses on Temperance Street in St. John's where Colin lives. They are a lovely set of four stone houses built by Samuel Garrett, the stonemason who built Cabot Tower on Signal Hill, where Guglielmo Marconi received the first trans-Atlantic wireless signal on December 1, 1901. The houses were built for each of his four daughters. Captains and Ships: An excellent description of the St. John's waterfront circa 1913, when the ships were gearing up to go to the ice for the seal hunt. In those days the waterfront consisted of finger piers which is why so many ships could tie up in the short distance between Harvey's and Bowring's wharves. Many of these ships and their captains were well known around Newfoundland since they were active in other coastal trade around the island and in Labrador when they weren't prosecuting the seal fishery. Where Do The Capelin Go? : The capelin that used to be so plentiful on the beaches of Newfoundland in late spring and early summer have been getting smaller, arriving later and in fewer numbers in recent years. As a crucial link in the food chain for all the larger fish, capelin are an important bio-indicator that we ignore at our peril. Human arrogance refuses to accept the fact that we are just one more animal in the zoo, no more or less important than the rest of them. Jim made this song to illustrate the point that people who live by and from the ocean are as much a part of the ocean environment as the creatures who live within it. Feller From Fortune/Auntie Mary: Our take on a pair of perennial Newfoundland favourites. They started out as instrumental dance tunes but acquired lyrics when gob musicians who provided music for dances got tired of diddling and composed on the spot lyrics to accompany the dances. 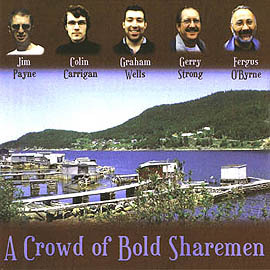 And A Crowd of Bold Sharemen: Composed by John Campbell Mitchell of Little Bay Islands (where Gerry's family comes from) Notre Dame Bay around 1915. Mitchell was one of the sharemen who signed on to the fishing voyage on the understanding that they would all share in the profits to be made from the processing of cod livers, a nice little bonus after the rigours of a late spring fishery. The skipper reneged on the agreement and unrest ensued aboard the boat. The livers were rendered into cod liver oil, a spoonful of which was standard issue to Newfoundland children at the start of the school day up until a generation ago. Imagine our delight when it was finally produced in capsule form. Incidentally, although the band takes its name from this song, it's purely a coincidence that this band would be singing about livers. MicMac Square Dance Tune/Off Go Those St. John's Girls/Stan Pickett's Tune: Great tunes for a square set, the first one we learned from the late Minnie White, who sadly passed away in December, 2001, at age 85 after an illustrious accordion playing career. Growing up in St. Alban's, Baie d'Espoir, she learned this tune from traveling across the bay to the MiqMaw community of Conne River. Colin and Gerry had the second tune, and the third one was learned from our very good friend and excellent accordion player, Stan Pickett, who brought a lot of great tunes into St. John's with him from his beloved Fair Island, Bonavista Bay. All titles traditional except: A Crowd of Bold Sharemen by John Campbell Mitchell (PD), The Gay Gunners by Peter Leonard (PD), The Four Sisters by Carrigan/Wells/Walsh ©SOCAN, and When We Was Boys and Where do the Capelin Go? by Jim Payne ©SOCAN. All arrangements by the band and Mark Neary. Thanks to Ann Anderson, Irene Brown, Fergus Brown O'Byrne, Cairo, Che, Marilyn Dawe, David Francey, Beth Girdler, Gracie, Jake, Heber John Keel, Marx, Mark Neary, Newfoundland and Labrador Folk Festival, Nigel, Bridget Noonan, Kaya Payne, Linda Russell, Judy Stamp, St. John's Folk Arts Council, Shari, Allison and Katherine Strong, Glen Tilley, Des Walsh, Don Walsh, Elaine and Graham Wells Sr., Janine Williams. Recorded at AudioLab Studios, St. John's, Newfoundland, April/May, August/September, 2002. Engineered by Mark Neary. Mixed by Mark Neary, Jim Payne and Fergus O'Byrne. Produced by Jim Payne and Fergus O'Byrne. © SingSong Inc. 2002. All rights reserved. Unauthorized duplication prohibited by law.